Manila, Philippines - The hard rock Razorback drummer died on January 16. Brian Velasco, 41 was a drummer of a famous rock band in the Philippines was on his last minute Facebook live streaming recording his last words, "Pakialagaan niyo na lang si Pochito". The musician said to the camera "I'm going to go now" before saluting his band mates. He then stood up and leaned over the edge before finally saying "Here I go". Facebook have now removed the video. His dead body was found on a canopy on the ground floor at 9:45am local time according to to the Manila Police District (MPD) Homecide Section. Velasco is an artist and a dog lover. 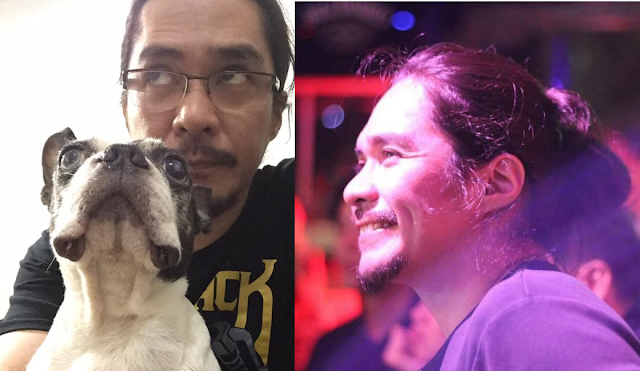 Velasco is match affected to the loss of his beloved pet dog in November, friends see him difficult to celebrate his birthday later that month, it has been reported. Days after his birthday, he shared also his sadness over the passing of his beloved Boston Terrier, Alfie. “The loss is undeniably massive yet I find comfort in the thought that he did not endure too long a suffering and that he led a good life loved by all. So today I celebrate the memory of a little dog with a massive heart who up until his last days, did not complain. I will sorely miss you, young man. Thank you for being a part of my life. Daddy loves you,” He wrote. Razorback was rose to fame back in the 90's for their iconic songs "Diwata," "Paghihintay," and "Giyang". Velasco joined the band in 1996 as replacement for Miguel Ortigas, his former drum instructor.